polka & bloom: 10% off all patterns! Well, you may have heard that some English/UK cycling chaps have had a bit of success recently? First winning Le Tour and then gold in the Olympic Road Race and Team Sprint. That's worth ringing your bike bell for! So, to celebrate, there's 10% off all embroidery patterns in the Polka & Bloom shop between now and Saturday (included). 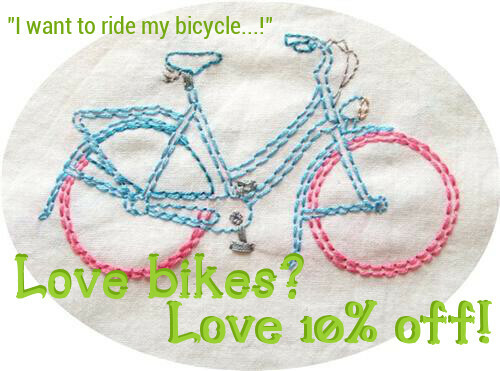 Just enter LOVEBIKES at check out. And if you want to stitch up some bikes, well, I've got you covered - there's two different sets of bike patterns in the shop: Keepin' Steady and Freewheelin'.